The contemporary design of the Lucia 40 optimizes the living volume inside and out, so you can enjoy your sailing holiday in style and create life-long memories with family and friends. La Mer Kat offers a light and bright interior with lots of large windows and opening hatches for great ventilation all day. She has a generator, so for added comfort at night, you will appreciate the air-conditioning throughout, which you can run on the anchorage. The 2 aft cabins have walk-around queen size beds and the 2 forward cabins have double beds, each with lights under the beds for a nice ambiance. Each cabin offers hanging locker, ample storage, hotel safe to secure valuables as well as light-blocking shades on the hatches, screens & opening ports. All 4 cabins are fully air conditioned with a control in each stateroom. Each hull has a spacious bathroom with a sink vanity area, an electric flush toilet and separate shower to keep the bathroom dry. 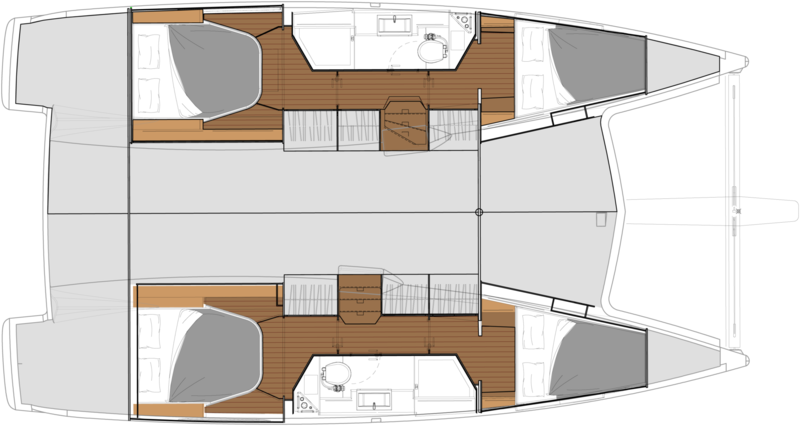 The huge cockpit is shaded by the hardtop bimini and features a large teak table, perfect for dining with a view. The cockpit settee is comfortable and the dining area can sit 8 – 10 guests comfortably when using the icebox as extra seats. Across from the table is an extra comfortable relaxing sofa. A few steps up from the cockpit is the helmsman’s seat, which can accommodate three persons. La mer kat has full Raymarine instrumentation with Touch Screen, Blue Tooth & Autopilot and all controls lead back to this station for easy sailing and docking the boat, with the captain only a step away from the deck to help with docking maneuvers. Just a few steps up from the helmsman seat takes you to the lounge deck on top of the hardtop bimini, perfect for sunning and enjoying the views. On the fore deck there is another lounge area and a new fitted trampoline for relaxing while sailing or on anchor. Large storage lockers are located in the front of each hull. The decks are wide and flat with all flush hatches.